Most of you are now familiar with Food Network’s bi-weekly summer fest. Every other week, using one main ingredient you have to create one recipe and that way you can participate in it with other food bloggers. This week the main ingredient is “Tomato”. As always, I was so confused with tons of ideas in my mind.You can literally make anything out of tomato…right? Say for example, Margherita pizza, Caprese salad, Brushetta, Tomato soup, Tomato curry etc…But I was like, all of you must be familiar with all these things and I wanted to make something different which is totally new to everyone. I really hope it is! 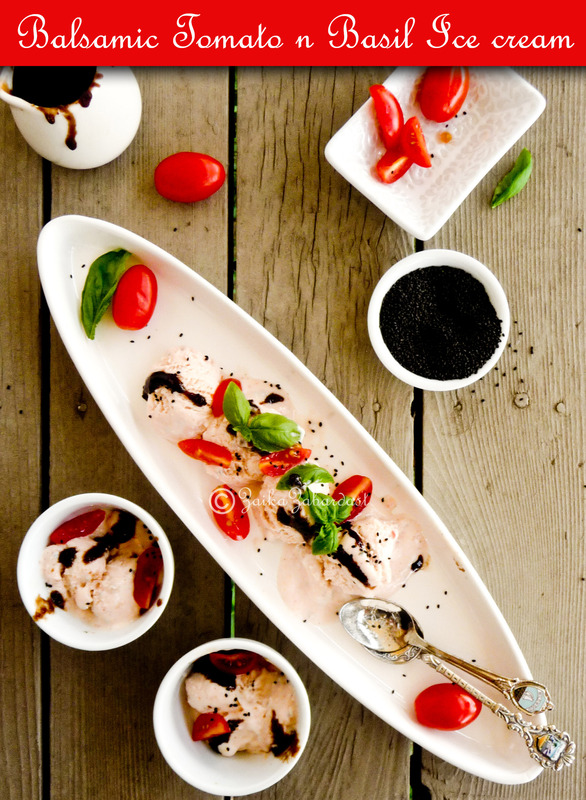 Have you had tomato ice cream before? If yes, I will appreciate if you leave a comment saying where you had it and how it was. If not, here you go. You must be wondering, why in the whole world she chose to use tomatoes into an ice-cream? I know, I know. Let me explain! I was really not sure with the flavors either, but I was very much determined to experiment with the flavors I loved the most. And that is none other than a combination of tomato and basil. It is like a match made in heaven, isn’t it? On the top of that a little bit of balsamic vinegar drizzled over tomatoes and basil is like icing on the cake. Excellent combination it is. I also added some ricotta cheese to give it a bit more creaminess. And you have to have some crunchiness in your ice cream, right? So I added plumped tukmaria (basil seeds) to fulfill that requirement. You can find Tukmaria (Basil seeds) in any Indian grocery stores. All the other ingredients are easily available in any grocery stores. 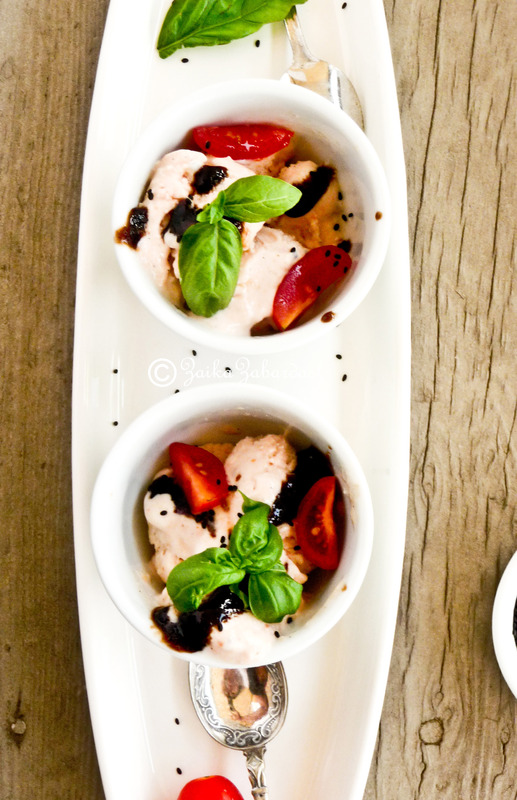 Also use good quality of balsamic vinegar, makes all the difference in the world. So basically, with all the courage in my heart I stepped out of my safe/comfort zone and used these flavors to make this ice cream and tadaaa…. it worked amazingly well. Both of us just loved it and the ice cream is so light that you can just finish the whole tub in one time. Hey, do you know that it even works as natural bleach for your facial skin? Mix the tomato pulp with some honey and olive oil and your homemade facial pack is ready. Leave it on your skin for 10 minutes and wash it off with warm water. Notice the difference. Don’t forget to apply some moisturizer. 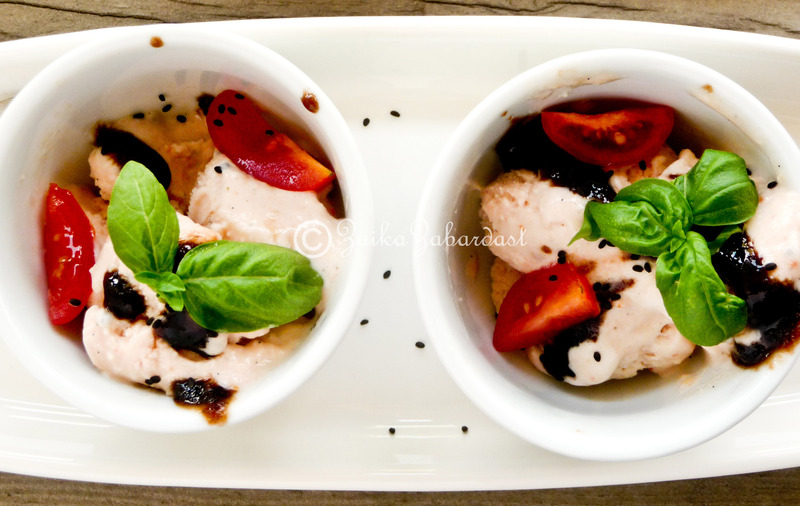 Okay okay, here is the recipe of amazing Balsamic roasted tomato and basil ice cream. I hope you will enjoy it. Preheat oven to 350 F. Cut cherry/grape tomatoes in half and toss them with balsamic vinegar. Arrange cut cherry tomatoes, cut side up, on baking sheet. Sprinkle with a pinch of salt (about 1/4 tsp) and roast for 30 minutes. Remove from oven and let cool completely. 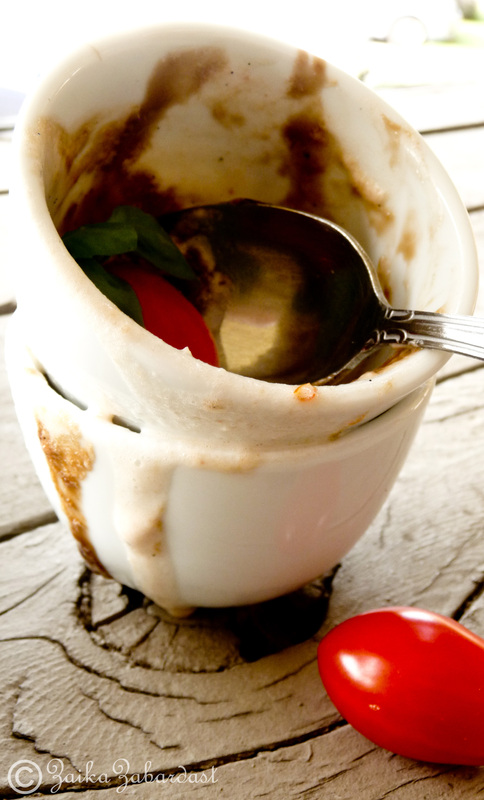 While your tomatoes are roasting in oven, side by side you can prepare for the ice cream base. In a small bowl, mix cornstarch with 1/4 cup milk and keep it aside. In a medium saucepan, whisk together remaining milk, half and half, sugar, and salt. Split Vanilla bean in half and add it to milk mixture. Add basil leaves and bring it to boil over medium heat. Basil will add flavor and change a color only a bit. When it comes to boil, cook it for 5 more minutes and then add cornstarch mixture while stirring continuously (Do not stop stirring, otherwise you will get cornstarch lumps in your creamy Ice-cream…naah You do not want that, right?). Bring it to boil one more time and cook for another 5 minutes or until the mixture coats the back of a spoon. Add ¼ cup of ricotta cheese to the mixture and mix well. Remove from heat and let it cool down. While it is cooling down, purée those roasted cherry tomatoes in your blender. When milk mixture is almost at room temperature, strain the mixture through a fine sieve. Use back of your spoon to extract all the juices before discarding basil n vanilla. Now it is time to sieve pureed tomatoes. Just leave out seeds and skin of tomatoes. So strain it well. I like the texture of tomato skin and seeds in my ice cream so I added a Tbsp of it before discarding it. So it is completely optional, if you want it add it. Cover with cling film directly on the surface of milk mixture and refrigerate at least 2 hours to chill. I did it over night. Once it is chilled, transfer mixture to an ice cream maker and process according to your manufacturer’s instructions. When you start churning your ice cream, soak basil seeds in to ¼ cup of warm water. This will help seeds to plump up a bit. Strain the water and add the plumped basil seeds during the last-minute of churning. When done, transfer ice cream to a freezer safe storage container and freeze until set. Mine took more than 5 hours to set completely. It also depends on your freezer. It is ready to serve. 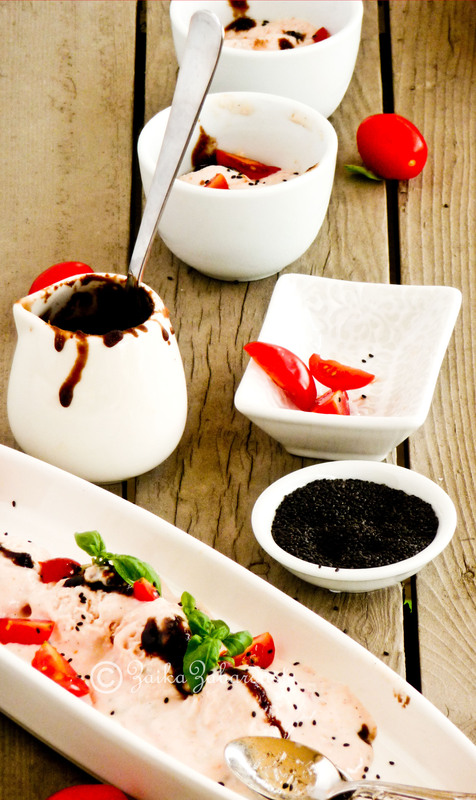 Garnish with some sliced cherry tomatoes, basil leaves and sprinkle with basil seeds. Taste: Super light, bit creamy. Tomatoes and vinegar adds little bit of tanginess but basil balances out everything. It adds wonderful aroma and makes it flavorful. Super like it! Do not forget to check out other Tomato posts from my fellow bloggers. I have not had ice cream made with tomatoes! Sounds very interesting. I have made sweet corn ice cream, green tea frozen yogurt, and tonight I made a dark chocolate ice cream with chilies…zingy! Thanks for sharing. oh wow. That really sounds yummm. I am planning to make chocolate chili Ice cream on Christmas. But hey why to wait for Christmas ryt? Also do you have these recipes on the blog? Would love to try some. oh my, that looks delicious! Never heard of it before! Pingback: Fresh and Savory Tomato Pie – The Best Summer Tomato Pie — A Denver Colorado Food Blog - Sharing food through recipes and photography. You really stepped out of your comfort zone. It looks super delicious. NICEEE..super flavorful post..nice clicks too!! Gorgeous! I would have never thought to add tomatoes into an ice cream but now I am completely intrigued. This would make an amazing appetizer. I am very compelled. Thank you for leaping, not stepping, out of your comfort zone; we all benefited greatly by this leap! Denise, Thank you very much for appreciating my effort. We just loved the flavors of this Ice-cream. And yes, it will really make an amazing appetizer but hey I will not mind having it as dessert too :). Either way it will be fantastic. Wonderful! I made a dessert out of mine too! But ice cream? Brilliant! Thank you Katie. I am glad you liked it. 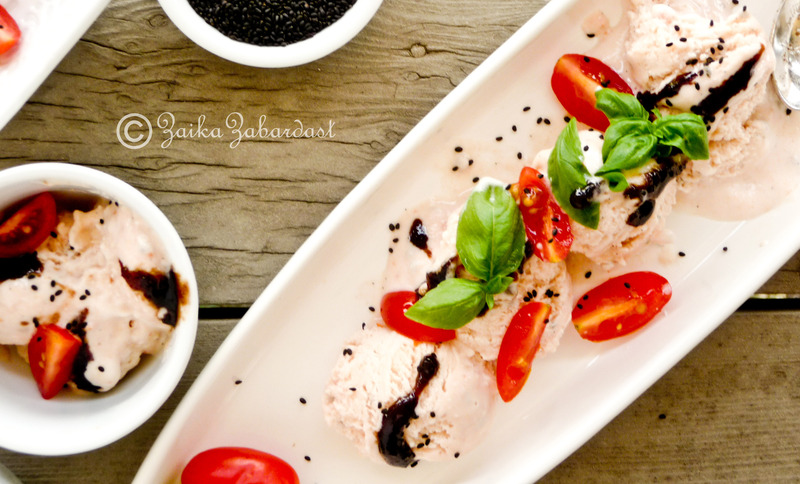 I have never had tomato ice cream, but I would love to try your version! Your photos are beautiful! I made this four years ago as gelato. And everyone told me it was weird. If I would have known I was ahead of a trend. I could see it – tomato is genetically a fruit. I bet it was amazing. I have to try that. So inspirational, thanks. Beautiful pictures …..considering the fact that taking pictures of an ice cream is very tough (since they are temperature sensitive) …. good job. Quite a unique kind of ice cream. We all love tomatoes in our family. I could go on and prepare some of this and see if it will work also for my kids. Such a beautiful looking dish! 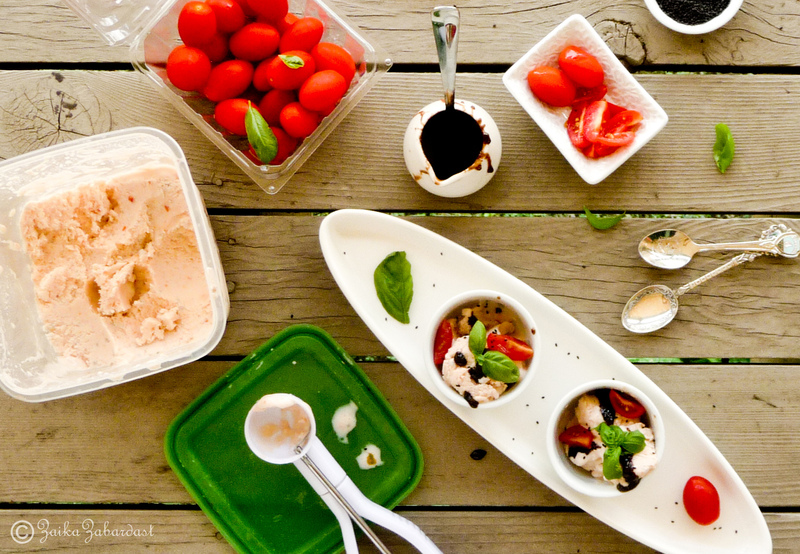 oooh, i have never tried a tomato icecream.. but with these pictures, i am game to try some!. thanks for dropping by.. do let me know how the muffins turn out! Ohh my god. i ever heard this kind of ice cream.. i really loved and i will definitely try out on my upcoming birthday and will enjoy with my friends. This is amazing. I have never had tomato ice cream before! Your photos are just beautiful!! The flavors are to die for here and very unique ones too! I love the desi basil seeds 🙂 and I love that slender tray of yours.. everything’s so very pretty here. Made this as a surprise appetizer- a take on caprese, with the basil garnish and a dot of fresh mozzarella. It is extraordinary! So light and interesting. (And pretty- served in a stem glass.) A recipe to keep. Thank you. I m happy to hear that u loved it n it’s a keeper for u 🙂 And I m sure it would have looked absolutely gorgeous especially with those tiny black basil seeds! Did u take any pictures? Would love to see it!